Did any of you grow up eating fruit cocktail from the little tiny can? My mom served it all the time, and I don’t know if I’m remembering it right, but I think our whole family shared the one little can. Not because we couldn’t afford more, but because fruit was way down the totem pole of food priorities, dwarfed by meat and potatoes. I remember the fruit was cut up in perfect little cubes, all in faded pastel shades. There were pale green grapes— I think they were peeled —and a lone pink cherry. We used to fight over that cherry. This idea came to me when I noticed that, amazingly, they’re still selling the stuff! This is my homage to that little can of fruit. Instead of insipid chunks of mushy pear and pathetic little skinned grapes, how about mango, papaya, berries, and melons. How about drenching them in a rum-enhanced simple syrup? They do call it a fruit cocktail, after all. This is an ideal use for leftover fruit. Cut it all in uniform small dice, and use a good variety of color and texture. It has the same appeal as a chopped salad—it takes a little prep but the result is worth it. I used watermelon, honeydew melon, strawberries, blueberries, blackberries, papaya, kiwi, grapes, pineapple, and cocktail cherries for garnish. Dice the fruit into uniformly small cubes. 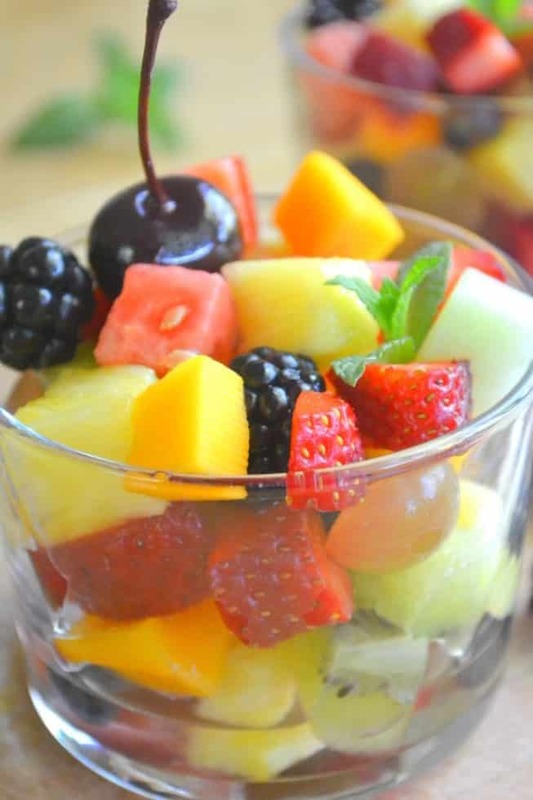 For the best results, put the fruit directly into small serving dishes. This will help keep the fruit intact. Pour a little Rum Simple Syrup over each dish and serve garnished with a cherry and a few mint leaves. To make the syrup, combine the water and sugar in a saucepan and stir well. Heat to a boil, stirring to dissolve all the sugar. Boil, uncovered, for 3 minutes. Take the syrup off the heat and add the mint and rum. Muddle, or crush, the mint leaves with a wooden spoon so they release their essential oils. Cool and then strain the syrup. You can keep the syrup in a jar with a tight fitting lid in the fridge indefinitely. Use what you have. I used tropical fruit cocktail in a #10 can mixed with fresh fruit like bananas, grapes, peaches, prunes, mango. Then I added some frozen berry mix and a can of Mandarin oranges. After its all mixed, separate the juice and cook with additional sugar, mint and a pinch of salt along with just a little rum. Once the sugar is dissolved let it cool off or add a few ice cubes. Then add the rest of the rum (I used Cachaca Pitu White Rum. Chill the whole thing for an hour or so and serve in little clear plastic cups with a sprig of mint on top.